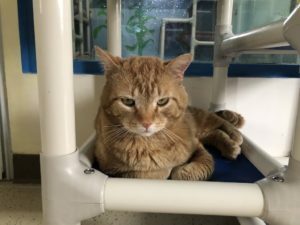 Lennon is a sweet male orange tabby who loves head scratches and chillin’. At the Wild Blue Sanctuary, he loves laying around in the outdoor catio on the artificial grass listening to the birds. His purrs can get pretty loud when you pet him and he loves to be brushed too. Lennon tested FIV+, which means that he can still live a long life with some extra care. 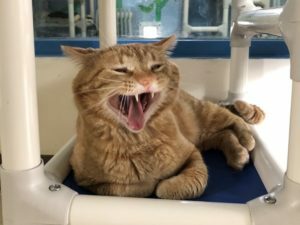 He is currently living with other cats, and can still live with other kitties as long as there isn’t a potential for transmission via a deep bite. PreviousPrevious post:Meet Kerry, Our June Volunteer of the Month!NextNext post:Meet Drezzy! Your Fuzzy Valentine, Sweet Comic Valentine!